SOURCE: THE TELEGRAPH – Three medics who scaled a roller-coaster to save the life of Alton Towers crash victim Leah Washington have won an award for their bravery. 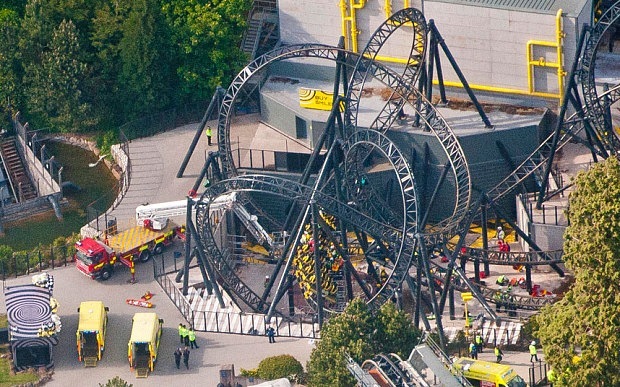 Army doctor Major David Cooper, 34, and aircrew paramedic Tom Waters, 27, were on duty with Midlands Air Ambulance when they were called to the theme park following the incident on the Smiler ride on June 2. Dr Ben Clark, 40, a volunteer with North Staffordshire BASICS emergency doctors, was also part of the emergency response team, who win a Pride of Britain Award. Despite having limited rope training, they ignored health and safety rules to climb the structure to save the lives of the trapped victims. All three say they did not think twice about risking their own lives – especially when they realised how serious the situation was for the most badly injured casualty, 18-year-old Ms Washington, from Barnsley, South Yorkshire. West Midlands Ambulance Service assistant chief Steve Wheaton, who co-ordinated the rescue, said the men put themselves at huge risk to work at that height. Dealing with a partial amputation at a height of 35 to 40ft, they managed to stem her life-threatening bleeding from a severed artery. They also carried out a life-saving blood transfusion while she was still trapped.